This is not my first time. Twelve years ago, October 6, 2012, three days after Bishop Alberto Ramento was brutally killed I received a text message saying that I will be the next to Ramento and to serve as sample in Cagayan de Oro for if they had killed Ramento who was a Supreme Bishop, they can also kill me who was only a priest then. It was the first death threat that I got. In July 25, 2013 my modest bedroom in the Cathedral of Pagadian was discovered to be ransacked by unknown suspects. This was two days after we have announced the Solidarity and Fact-finding mission with some Canadians to a mining site in Bayug, Zamboanga del Sur that will happen in the next two days. 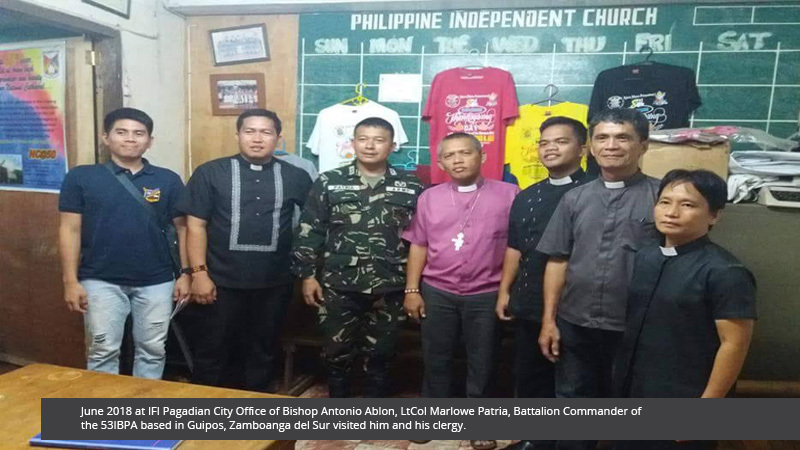 In October 7, 2015 my working quarter in the Pro-Cathedral Church in Tubod, Lanao del Norte was also ransacked (raided) by also unknown perpetrators and stolen the PC of the computer. But it was not an ordinary robbery because the other more valuable items were left untouched. A threatening note were left saying, “Watch out” and “Be ready”. This happened after the launching of Barug Katungod Mindanao, a broad alliance of human rights advocates, in Cagayan de Oro where we have arrested a police intelligence agent with his caliber .45 pistol who disguise himself as a participant to the activity representing the lumads. Today, we have the malicious writings on the retaining walls of the municipalities of Tigbao and Kumalarang Zamboanga del del Sur including one in our Chapel situated in the highway of Brgy. Gatub in the municipality of Lakewood, Zamboanga del Sur. 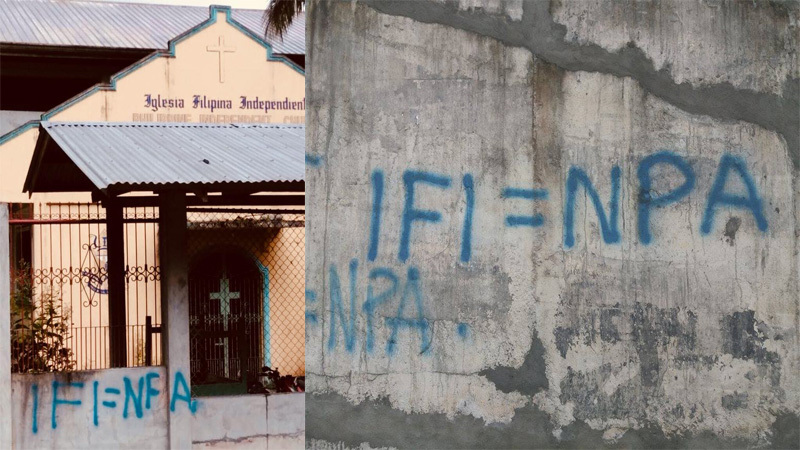 The writings were maligning, vilifying the Iglesia Filipina Independiente, the United Church of Christ in the Philippines and the Rural Missionaries of the Philippines the implementing arm of the Association of Major Religious Superiors of the Philippines equating these churches and organizations and myself with the New People’s Army. 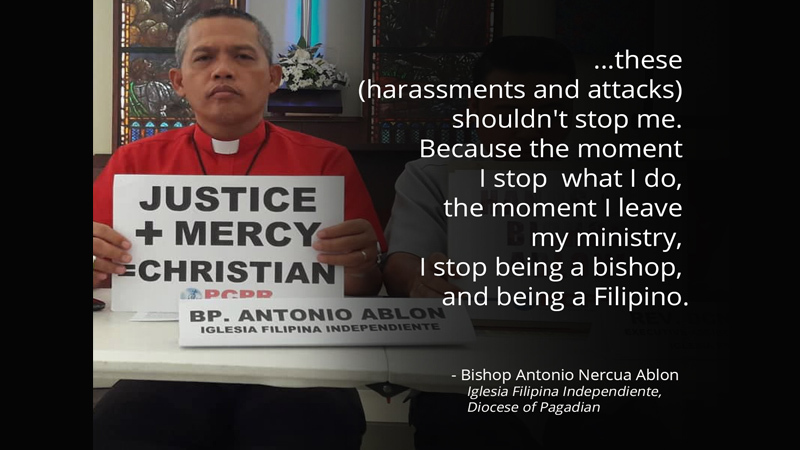 Obviously, these red-tagging is aimed at threatening, harassing and intimidating the church-people including myself to stop doing our God-entrusted ministry to the people who are in need – the oppressed, marginalized and depressed. They are the lumads, the farmers, the workers and urban poor who are voiceless and are victimized by the powers that be, the state that had been giving way to the entry of multi-national corporations of mining and plantations to supply the first world countries’ needs. This is terribly fearsome because the government and the AFP and PNP since from the very beginning of the insurgency campaign have always demonstrated their incapability to know and determine who are their real enemies in this long-protracted war on-going in the country. 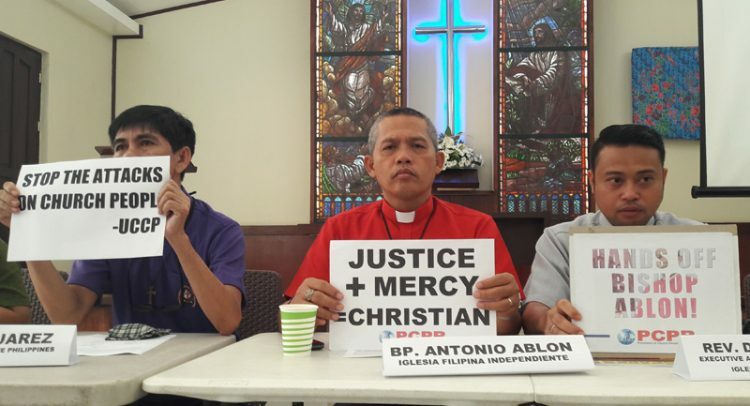 The government and state security officers only see red, and their temerity to vanquish the NPA includes eliminating or silencing the church and church people and other legal organizations which are only advocating in behalf of the struggling Filipino people. Instead the government’s insurgency campaign has been littered by the waste of innocent lives way-laid due to red-tagging and labelling. But we cannot be cowed by this as we continue to live out the Christian tenets of loving God by serving the least of the brethren which is equal to loving and serving the lumads, the peasants and other oppressed and terrorized people above oneself.